Eucharistic adoration is a Eucharistic practice in the Roman Catholic, Anglo-Catholic and some Lutheran traditions, in which the Blessed Sacrament is adored by the faithful. This practice may occur either when the Eucharist is exposed, or when it is not publicly viewable because it is reserved in a place such as a church tabernacle. Adoration is a sign of devotion to and worship of Jesus Christ, who is believed by Catholics to be present Body, Blood, Soul, and Divinity, under the appearance of the consecrated host, that is, sacramental bread. From a theological perspective, the adoration is a form of latria, based on the tenet of the real presence of Christ in the Blessed Host. Christian meditation performed in the presence of the Eucharist outside Mass is called Eucharistic meditation. It has been practiced by such as Peter Julian Eymard, Jean Vianney and Thérèse of Lisieux. Authors such as the Venerable Concepcion Cabrera de Armida and Blessed Maria Candida of the Eucharist have produced large volumes of text based on their Eucharistic meditations. When the exposure and adoration of the Eucharist is constant (twenty-four hours a day), it is called perpetual adoration. In a monastery or convent, it is done by the resident monks or nuns and, in a parish, by volunteer parishioners since the 20th century. In a prayer opening the Perpetual chapel in St. Peter Basilica, Pope John Paul II prayed for a perpetual adoration chapel in every parish in the world. Pope Benedict XVI instituted perpetual adoration for the laity in each of the five sectors of the diocese of Rome. Eucharistic adoration may be done both when the Eucharist is exposed for viewing and when it is not. 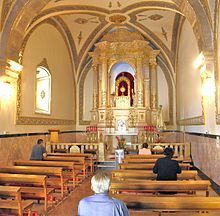 It may take place in the context of the liturgical rite of Exposition of the Blessed Sacrament or an informal "visit" to pray before the tabernacle. Writer Valerie Schmalz notes that "During the first part of the twentieth century, it was common for Catholics, young and old, on their way home from work or school, en route to the grocery store or a sports practice, to "stop in for a visit" to the Blessed Sacrament in their local church. Most times the Eucharist was not exposed, but a red candle – then, as now – showed the Presence in the tabernacle." Since the Second Vatican Council, the Catholic church has made Eucharistic exposition and benediction a liturgical service in its own right and exercised more direction over its practice; it draws its primary meaning from the Eucharistic celebration itself. "By worshiping the Eucharistic Jesus, we become what God wants us to be! Like a magnet, The Lord draws us to Himself and gently transforms us." At the beginning of the exposition of the Blessed Sacrament, a priest or deacon removes the sacred host from the tabernacle and places it in the monstrance on the altar for adoration by the faithful. A monstrance is the vessel used to display the consecrated Eucharistic Host, during Eucharistic adoration or benediction. The adoration may also take place when the Eucharist is not exposed but left in a ciborium, which is likewise placed on an altar or in an enclosed tabernacle so that the faithful may pray in its presence without the need for volunteers to be in constant attendance (as is required when the Blessed Sacrament is exposed). The "Instruction on Eucharistic Worship", issued by the Sacred Congregation of Rites on the Feast of Corpus Christi, 25 May 1967, reads in pertinent part, "The exposition of the Blessed Sacrament, for which either a monstrance or a ciborium may be used, stimulates the faithful to an awareness of the marvelous presence of Christ and is an invitation to spiritual communion with Him. It is therefore an excellent encouragement to offer Him that worship in spirit and truth which is His due." The visit to the Blessed Sacrament is a great treasure of the Catholic faith. It nourishes social love and gives us opportunities for adoration and thanksgiving, for reparation and supplication. Benediction of the Blessed Sacrament, Exposition and Adoration of the Blessed Sacrament, Holy Hours, and Eucharistic processions are likewise precious element of your heritage--in full accord with the teaching of the Second Vatican Council." 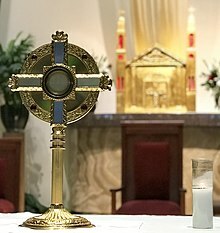 As to the manner in which Eucharistic adoration is conducted, the "Instructions" state: "Even brief exposition of the Blessed Sacrament, ...should be so arranged that before the blessing with the Blessed Sacrament reasonable time is provided for readings of the Word of God, hymns, prayers, and silent prayer, as circumstances permit." While psalms, readings and music are part of the liturgical service, in common practice silent contemplation and reflection tend to predominate. Where Eucharistic adoration is done by an individual for an uninterrupted hour, this is known as a Holy Hour. The inspiration for the Holy Hour is Matthew 26:40 when in the Garden of Gethsemane the night before his crucifixion, Jesus asks Peter: "So, could you not keep watch with me for one hour?". Some Christian denominations that do not subscribe to transubstantiation consider Eucharistic adoration unfounded and even bordering on idolatry. But according to the United States Conference of Catholic Bishops, exposition "serves to deepen our hunger for Communion with Christ and the rest of the Church." While the keeping of the Blessed Sacrament outside Mass seems to have been part of the Christian practice from the beginning to administer to the sick and dying (both Justin Martyr and Tertullian refer to it), the practice of adoration began somewhat later. One of the first possible references to reserving the Blessed Sacrament for adoration is found in a life of St. Basil (died AD 379). Basil is said to have divided the Eucharistic bread into three parts when he celebrated the Divine Liturgy in the monastery. One part he consumed, the second part he gave to the monks, and the third he placed in a golden dove-shaped container suspended over the altar. This separate portion was probably to reserve the sacrament for distribution to the sick who were unable to attend the liturgy. In Eastern Christianity, the adoration which developed in the West has never been part of the Eastern liturgy which St. Basil celebrated, but a liturgy for adoration does exist among the Eastern Catholic Churches involving psalms and placing a covered diskos with the sacred species on the altar. This is befitting the Eastern custom of veiling from human eyes those things deemed sacred. This profession of faith began a "Eucharistic Renaissance" in the churches of Europe. The Franciscan archives credit Saint Francis of Assisi (who died in 1226) for starting Eucharistic Adoration in Italy. It then spread from Umbria to other parts of Italy. In 1264 Pope Urban IV instituted the feast of Corpus Christi ("the Body of Christ") with the publication of the papal bull Transiturus. He asked the Dominican theologian Thomas Aquinas to write the texts for the Mass and Office of the feast. This included such famous hymn as Panis angelicus, and Verbum Supernum Prodiens the last two strophes of which form the Benediction hymn O Salutaris Hostia. The last two verses of Pange Lingua are sung as the hymn Tantum Ergo, also used at Benediction. In the 16th century, the Protestant Reformation was challenging various issues with respect to the Eucharist and in response the Council of Trent greatly emphasized the presence of Christ in the Eucharist, the theological basis for Eucharistic adoration. The Trent declaration was the most significant theological component of Eucharistic doctrine since the apostolic age. The statement included the following: The other sacraments do not have the power of sanctifying until someone makes use of them, but in the Eucharist the very Author of sanctity is present before the Sacrament is used. For before the apostles received the Eucharist from the hands of our Lord, He told them that it was His Body that He was giving them. The only-begotten Son of God is to be adored in the Holy Sacrament of the Eucharist with the worship of "latria", including external worship. The Sacrament, therefore, is to be honored with extraordinary festive celebrations (and) solemnly carried from place to place in processions according to the praiseworthy universal rite and custom of the holy Church. The Sacrament is to be publicly exposed for the people's adoration. Following the Council of Trent, figures such as Saints Charles Borromeo and Alain de Solminihac promoted Eucharistic devotion and adoration. As part of the simplification of Church interiors, and to emphasize the importance of the Blessed Sacrament, Charles Borromeo initiated the practice of placing the tabernacle at a higher, central location behind the main altar. As Eucharistic adoration and Benediction became more widespread during the 17th century, the altar came to be seen as the "home of the Blessed Sacrament" where it would be adored. A common early practice of adoration known as Quarantore (literary forty hours) started in the 16th century. It is an exercise of devotion in which continuous prayer is made for forty hours before the exposed Blessed Sacrament. This practice started in Milan in the 1530s and 1540s by Capuchins such as Giuseppe da Fermo who promoted long periods of adoration. From Northern Italy it was carried to elsewhere in Europe by the Capuchins and Jesuits. The practice of the perpetual adoration of the Blessed Sacrament started in Naples in 1590 within the Order of the Clerics Regular Minor, founded by St. Francis Caracciolo, Fr. Augustine Adorno and Fr. Fabrizio Caracciolo. This practice was modified to continuous adoration during the day due to the few number of religious in the Order's Constitutions of 1597 with approval by Pope Clement VIII  At a later date, the Order would revert to its earlier rule of perpetual adoration, but only within houses of no less than twenty religious. The houses with less religious were offered perpetual adoration as an option if it would not interfere with the execution of the house's ministries. In the 18th century, large numbers of people were drawn to quiet adoration of the Eucharist and priests such as Alphonsus Liguori encouraged the practice. He wrote a book on Visits to the Blessed Sacrament and he explained that a visit to the Blessed Sacrament is the "practice of loving Jesus Christ", since friends who love each other visit regularly. Benedict Joseph Labre, a homeless beggar and Franciscan tertiary, was a familiar figure in the city of Rome and known as the "saint of the Forty Hours" (or Quarant' Ore) for his dedication to Eucharistic adoration. The French Revolution hindered the practice of Eucharistic adoration, however, the beginning of the 19th century witnessed a strong emphasis on Eucharistic piety, devotions and adorations. By 1829, the efforts of the Confraternity of Penitents-Gris brought Eucharistic adoration back in France. Twenty years later, the Venerable Leo Dupont initiated the nightly adoration of the Blessed Sacrament in Tours in 1849, from where it spread within France. Saint Anthony Mary Claret, the confessor to Isabella II of Spain and the founder of the Claretians, was also a fervent promoter of Eucharistic devotion and adoration and introduced the practice to Cuba, where he was sent as Archbishop. The adoration of the Eucharist within France grew in this period, and there were interactions between Catholic figures who were enthusiastic about spreading the practice, e.g., Leo Dupont, Saint Jean Vianney and Saint Peter Julian Eymard who in 1858 formed the Congregation of the Blessed Sacrament. Also in 1858, Eymard, known as the Apostle of the Eucharist, and sister Marguerite Guillot formed the Servants of the Blessed Sacrament which now maintains houses on several continents where continuous Eucharistic adoration takes place. By Decree of the Congregation for the Sacraments and Divine Worship, dated 9 December 1995, Saint Peter Julian Eymard, Priest, was added to the General Roman Calendar with the rank of optional memoria: Font and fullness of all evangelization and striking expression of the infinite love of our divine Redeemer for mankind, the Holy Eucharist clearly marked the life and pastoral activity of Peter Julian Eymard. He truly deserves to be called an outstanding apostle of the Eucharist. In fact, his mission in the Church consisted in promoting the centrality of the Eucharistic Mystery in the whole life of the Christian community. The first informally organized Eucharistic Congress took place in 1874, through the efforts of Marie-MartheTamisier of Tours, France. In 1881 Pope Leo XIII approved the first formal Eucharistic Congress which was organized by Louis-Gaston de Ségur in Lille France and was attended by few adherents. The 1905 congress took place in Rome and Pope Pius X presided over it. 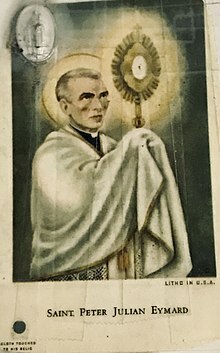 The practice of prolonged Eucharistic adoration also spread to the United States in the 19th century and Saint John Neumann the Archbishop of Philadelphia started Forty Hours adorations there, where it continues to date. Early Anglicanism officially rejected Eucharistic adoration. Article XXVIII – Of the Lord's Supper in Anglicanism's 39 Articles rejects transubstantiation, declaring that "Transubstantiation (or the change of the substance of Bread and Wine) in the Supper of the Lord, cannot be proved by Holy Writ; but is repugnant to the plain words of Scripture, overthroweth the nature of a Sacrament, and hath given occasion to many superstitions." The Article also states that "The Sacrament of the Lord's Supper was not by Christ's ordinance reserved, carried about, lifted up, or worshiped." Furthermore, the Black Rubric (in both its 1552 and 1662 versions) explains that "the Sacramental Bread and Wine remain still in their very natural substances, and therefore may not be adored; for that were Idolatry, to be abhorred of all faithful Christians". However, since the mid-19th century, the Oxford Movement has broadened Anglican opinions on the matter. An early 20th century bishop, the Right Reverend Edgar Gibson, Bishop of Gloucester, wrote of Article 28 that "The statement in the Article is worded with the utmost care, and with studied moderation. It cannot be said that any one of the practices is condemned or prohibited by it. It only amounts to this: that none of them can claim to be part of the original Divine institution." Today, opinions on the nature of the Eucharist and thus on the propriety of adoration and exposition of the Blessed Sacrament vary in the Anglican tradition (see Anglican Eucharistic theology), but many Anglo-Catholics practice Eucharistic adoration. Others celebrate Benediction of the Blessed Sacrament, which is not unlike Eucharistic adoration. Lutheran Eucharistic adoration is most commonly limited in duration to the Eucharistic service because Lutheran tradition typically does not include public reservation of the Sacrament. If the holy elements are not consumed at the altar or after the service, then they can be set aside and placed in an aumbry, which is normally located in the sacristy. Primarily, the extra hosts are reserved for another Eucharist or for taking to the sick and those too feeble to attend a church service. However, in North America and Europe, some Lutherans may choose to reserve the Eucharist in a tabernacle near the altar. The Anglo-Lutheran Catholic Church and some parishes in the Lutheran Evangelical Catholic tradition strongly encourage Eucharistic adoration. Historically in Lutheranism there have been two parties regarding Eucharistic adoration: Gnesio-Lutherans, who followed Martin Luther's view in favor of adoration, and Philippists who followed Philipp Melanchthon's view against it. Although Luther did not entirely approve of the Feast of Corpus Christi, he wrote a treatise The Adoration of the Sacrament (1523) where he defended adoration but desired that the issue not be forced. In his reform of the Roman Mass Luther placed the Sanctus after the Institution Narrative to serve as a solemn act of worship of the Real Presence just brought about by the latter. After the death of Martin Luther, further controversies developed including Crypto-Calvinism and the second Sacramentarian controversy, started by Gnesio-Lutheran Joachim Westphal. The Philippist understanding of the Real Presence without overt adoration through time became dominant in Lutheranism, although it is not in accordance with Luther's teaching. The German theologian Andreas Musculus can be regarded as one of the warmest defenders of Eucharistic adoration in early Lutheranism. Eucharistic adoration in the Chapel of the Apparitions of the Sanctuary of Our Lady of Fátima in Portugal. In Catholic teachings, at the moment of Consecration the elements (or "gifts" as they are termed for liturgical purposes) are changed in substance (transubstantiation – as opposed to 'transformation' wherein a change in physical form occurs) into the actual Body and Blood of Christ. Catholic doctrine holds that the elements are not only spiritually changed, but rather their substances are actually (substantially) changed into the Body, Blood, Soul and Divinity of Christ. In the doctrine of Real Presence, at the point of Consecration, the act that takes place is a double miracle: 1) that Christ is present in a physical form and 2) that the bread and wine have truly, substantially become Jesus' Body and Blood. (However, the Scholastic-philosophical meaning of "substance" and "transubstantiation" are not matter for Catholic dogma.) Because Roman Catholics believe that Christ is truly present (Body, Blood, Soul and Divinity) in the Eucharist, the reserved sacrament serves as a focal point of adoration. The Catechism of the Catholic Church states that: "The Eucharistic presence of Christ begins at the moment of the consecration and endures as long as the Eucharistic species subsist." St. Faustina Kowalska stated that she was called to religious life while attending the Exposition of the Blessed Sacrament at age seven. Notable examples of conversion are Saints Elizabeth Ann Seton and John Henry Newman, both having converted from Anglicanism, and the Venerable Hermann Cohen (Carmelite), O.C.D., from Judaism, following Eucharistic adoration. Cohen went on to help establish the widespread practice of nocturnal adoration. The practice of a "daily Holy Hour" of adoration has been encouraged in the Catholic tradition. Mother Teresa of Calcutta had a Holy Hour each day and all members of her Missionaries of Charity followed her example. Since the Middle Ages the practice of Eucharistic adoration outside Mass has been encouraged by the popes. In the midst of the Second Vatican Council, on 3 September 1965, a few days before opening the fourth session, Pope Paul VI issued the Encyclical Mysterium fidei whereby he urged daily Mass and communion and said, "And they should not forget about paying a visit during the day to the Most Blessed Sacrament in the very special place of honor where it is reserved in churches in keeping with the liturgical laws, since this is a proof of gratitude and a pledge of love and a display of the adoration that is owed to Christ the Lord who is present there." St. Pius X used to say: "The daily adoration or visit to the Blessed Sacrament is the practice which is the fountainhead of all devotional works,"
In Dominicae Cenae Pope John Paul II stated: "The Church and the world have a great need of Eucharistic worship. Jesus waits for us in this sacrament of love. Let us be generous with our time in going to meet Him in adoration and in contemplation that is full of faith." And he added in Ecclesia de Eucharistia: "The worship of the Eucharist outside of the Mass is of inestimable value for the life of the Church.... It is the responsibility of Pastors to encourage, also by their personal witness, the practice of Eucharistic adoration, and exposition of the Blessed Sacrament." From his early years, the Eucharist had a central place in the theology of Joseph Ratzinger and in his role as Pope Benedict XVI. In his book God Is Near Us: The Eucharist, the Heart of Life he strongly encouraged Eucharistic adoration. O most Holy Trinity, Father, Son, and Holy Spirit, I adore You profoundly. I offer You the Most Precious Body, Blood, Soul and Divinity of Jesus Christ, present in all the tabernacles of the world, in reparation for the outrages, sacrileges and indifferences by which He is offended. By the infinite merits of the Sacred Heart of Jesus and the Immaculate Heart of Mary, I beg the conversion of sinners. I adore You, O my Savior, present here as God and Man, in Soul and Body, in true Flesh and Blood. I acknowledge and confess that I kneel before the Sacred Humanity, which was conceived in Mary's womb, and lay in Mary's bosom; which grew up to man's estate, and by the Sea of Galilee called the Twelve, wrought miracles, and spoke words of wisdom and peace; which in due season hung on the cross, lay in the tomb, rose from the dead, and now reigns in heaven. Eucharistic celebrations of any nature are sometimes initiated with the first four or at least the first stanza of the hymn Pange lingua, and often concluded with the Tantum ergo (being the other two stanzas of the same hymn), or at the least the versicle and oration attached to the Tantum ergo (see the article). These hymns and orations are from the Daily Office for Corpus Christi, composed by St. Thomas Aquinas. Apart from promoting the Eucharist, Saint Peter Juliian Eymard also made meditations before the Blessed host and his writings were later published as a book: The Real Presence. His contemporary Saint Jean Vianney also performed Eucharistic meditations which were later published. Saint Thérèse of Lisieux was devoted to Eucharistic meditation and on 26 February 1895 shortly before she died wrote from memory her poetic masterpiece "To Live by Love" which she had composed during Eucharistic meditation. During her life, the poem was sent to various religious communities and was included in a notebook of her poems. Significant portions of the writings of the Venerable Concepcion Cabrera de Armida were reported as having been based on her meditations during adoration of the Blessed Sacrament. In her book Eucharist: true jewel of eucharistic spirituality Maria Candida of the Eucharist (who was beatified by Pope John Paul II) wrote about her own personal experiences and reflections on Eucharistic meditation. Perpetual adoration is the practice of the continuous exposition and adoration of the Eucharist, twenty-four hours a day. Similar to the "Perpetual Rosary" in which the Rosary is recited uninterrupted by a changing group of people, this practice gained popularity among Roman Catholics in 19th century France and has since spread to lay Catholics in parishes across the world.A textbook was produced by a lay catholic, Susan Taylor, with help from monks and clergy as a "how to set up Perpetual Adoration". During perpetual adoration, a specific person performs adoration for a period of one hour or more, so there is always at least one person who performs adoration during each day and night. However, during Mass the Blessed Sacrament should be reposed and is then exposed again after Mass. The only other time perpetual adoration is not performed is during the three days of Easter Triduum. Perpetual adoration of God by psalm and prayer has been a tradition among Christians since ancient times, e.g., in Eastern Christianity since the year 400 when the Acoemetae monks kept up a divine service day and night; and in Western Christianity the monks at the monastery of Agaunum performed perpetual prayers since its formation in 522 by King Sigismund. The first recorded instance of perpetual adoration formally began in Avignon, France, on 11 September 1226. To celebrate and give thanks for the victory over the Albigensians in the later battles of the Albigensian Crusade, King Louis VIII asked that the sacrament be placed on display at the Chapel of the Holy Cross. The overwhelming number of adorers brought the local bishop, Pierre de Corbie, to suggest that the exposition be continued indefinitely. With the permission of Pope Honorius III, the idea was ratified and the adoration continued there practically uninterrupted until the chaos of the French Revolution halted it from 1792. On 25 March 1654 Mother Mechtilde of the Blessed Sacrament formed a Benedictine society formed for that purpose. Mother Mechtilde pioneered perpetual adoration of the Eucharist on request of Père Picotte. Père Picotte was the confessor of Anne of Austria who asked him for a vow for the deliverance of France from war and the order was formed in response to that vow. A small house was bought on Rue Feron in Paris and a Benedictine convent, founded for this purpose, began perpetual adoration there on 25 March 1654, one or more nuns kneeling in front of the altar in adoration each hour of the day and night. The simple Benedictine rules with which the nuns started were amended and formal approval for perpetual adoration was provided by the Camera Apostolica in Rome in 1705. Various Roman Catholic societies and orders were formed for the specific purpose of perpetual adoration prior to the 19th century, e.g., the Perpetual Adorers of the Blessed Sacrament (1659 in Marsaille), Congregation of the Sacred Hearts of Jesus and Mary and of the Perpetual Adoration (formed in 1768 in Paris), and the Religious of the Perpetual Adoration (1789, Switzerland). By the beginning of the 19th century, in France as well as elsewhere in Europe, strong currents in favor of Eucharistic piety, devotions and adoration began to appear. Preachers such as Prosper Guéranger, Peter Julian Eymard and Jean Vianney were very effective in renewing such devotions. The 19th century thus witnessed a rapid growth in perpetual adoration societies, and some existing orders (e.g., the Dominicans and the Poor Clares) e.g. : Sisters of the Perpetual Adoration (1845 in Brittany), Poor Clares of Perpetual Adoration (also in 1854), Religious of Perpetual Adoration (Brussels, 1857), Servants of the Most Blessed Sacrament (1858, Paris), Sisters of St. Francis of Perpetual Adoration (1863, Olpe, Germany), Holy Spirit Adoration Sisters (the Netherlands, 1896). A number of perpetual adoration orders were also formed in the United States, e.g., Franciscan Sisters of Perpetual Adoration (1849 Wisconsin) and Benedictine Sisters of Perpetual Adoration (1874, Clyde, Missouri). The Poor Clares of the Monastery of Saint Mary of the Angels of Perpetual Adoration, in Drumshanbo, Ireland, first established perpetual adoration on 25 March 1870, and have continued the practice uninterrupted to this day. The Franciscan Sisters of Perpetual Adoration have been praying nonstop longer than anyone in the United States; the practice began on 1 August 1878, at 11 a.m. and continues to this date. In the 20th century, the practice of perpetual adoration spread from monasteries and convents to Catholic parishes at large, and is now also performed by lay Catholics. The perpetual adoration chapel in Saint Peter's Basilica was inaugurated by Pope John Paul II in 1981 and a number of the major basilicas in Rome have also started perpetual adoration in the 20th century. Early in the 20th century, questions arose as to the suitability of perpetual adoration by lay Catholics. However, after various discussions, on 2 June 1991 (feast of Corpus Christi), the Pontifical Council for the Laity issued specific guidelines that permit perpetual adoration in parishes. In order to establish a "perpetual adoration chapel" in a parish, the local priest must obtain permission from his bishop by submitting a request along with the required information for the local "perpetual adoration association", its officers, etc. At the beginning of the 21st century, there were over 2,500 perpetual adoration chapels in Catholic parishes around the world. The United States (with about 70 million Catholics) had about 1,100 chapels, the Philippines (with about 80 million Catholics) 500, the Republic of Ireland (with about 4 million Catholics) about 150, South Korea (with about 4 million Catholics) had about 70. The world's largest monstrance is in Chicago where a perpetual adoration chapel is under construction. This Sanctuary devoted to The Divine Mercy is being constructed adjacent to Church of St. Stanislaus Kostka, one of the city's Polish churches. ^ Separate chapel; 1967 (1967-05-25). "Eucharisticum Mysterium - Instruction on Eucharistic Worship, 53". Adoremus Bulletin. Retrieved 2017-04-26. ^ "Meeting with the Clergy of the Rome Diocese (March 2, 2006) | BENEDICT XVI". w2.vatican.va. Retrieved 2018-12-24. ^ a b Dimock 2006, pp. 88–90. ^ a b "What is Eucharistic Adoration?". www.catholic-church.org. Retrieved 2018-12-24. ^ Instruction on Eucharistic Worship, §60. ^ "Pope John Paul II Recalls and Encourages National Eucharistic Devotion"
^ Instruction on Eucharistic Worship, §66. ^ Stravinskas 1998, p. 498. ^ "Eucharistic Devotion". www.usccb.org. Retrieved 2018-12-24. ^ Hardon 1997, p. 3. ^ "Eucharistic Adoration". Our Sunday Visitor Catholic Publishing Company. Retrieved 2018-12-24. ^ Hardon 1997, p. 5. ^ a b Hardon 1997, p. 8. ^ Hardon 1997, p. 9. ^ Hardon 1997, p. 11. ^ Dimock 2006, p. 125. ^ "Services". Church of the Ascension, Chicago. 2006. Archived from the original on 9 February 2006. Retrieved 23 May 2015. ^ "Catechism of the Catholic Church - The sacrament of the Eucharist". www.vatican.va. Retrieved 2018-12-24. ^ "Encyclical Letter Ecclesia de Eucharistia". www.vatican.va. Retrieved 2018-12-24. ^ "Fatima 100th Anniversary - Third Apparition of the Angel of Portugal". www.ewtn.com. Retrieved 2018-12-24. ^ "Maria Candida of the Eucharist (1884-1949), biography". www.vatican.va. Retrieved 2018-12-24. ^ Stravinskas 1998, p. 776. ^ "Perpetual Adoration". perpetualadoration.info. Retrieved Oct 3, 2018. ^ a b c Stravinskas 1998, p. 409. ^ Alban Butler; Paul Burns (1998). Butler's Lives of the Saints: August. Burns & Oats. p. 16. ISBN 0860122573. ^ "History". Poor Clare Colettine Federation of St. Mary of the Angels in Ireland & Scotland. ^ "Perpetual Adoration". Franciscan Sisters of Perpetual Adoration (FSPA). 2014-06-24. Retrieved 2018-12-24. ^ "Bollettino". www.vatican.va. Retrieved 2018-12-24. Dimock, Giles (2006). 101 questions and answers on the Eucharist. ISBN 978-0-8091-4365-8. Hardon, John A. (1997). The History of Eucharistic Adoration. CMJ Marian Publishers. ISBN 0-9648448-9-3. Pope Paul VI (3 September 1965). "Mysterium Fidei". Libreria Editrice Vaticana. Sacred Congregation of Rites. "Instruction on Eucharistic Worship". Stravinskas, Peter (1998). Our Sunday Visitor's Catholic Encyclopedia. OSV Press. ISBN 978-0-87973-669-9. This page was last edited on 11 March 2019, at 07:27 (UTC).